Q. How can I deal with plosives? Is there a good technique for treating plosives on a vocal track? I've found lots of advice on de-essing, but nothing on this. Plosive thumps on vocal recordings are caused by strong blasts of air that result from certain consonant sounds hitting the microphone and creating large pressure changes. It's far better to prevent them rather than attempting to fix them in the studio. A basic method of prevention is to use a pop shield, positioned a couple of inches or more from the mic, and certainly no closer than one inch. SOS Technical Editor Hugh Robjohns replies: Plosives are often a complete nightmare to remove, and the only real solution is to prevent them from happening in the first place. Plosives — usually heard on words with Ps and Bs at their start — send out a strong blast of air, which generally travels forward and downward from the mouth. If that air blast reaches the microphone diaphragm, it creates a massive pressure change that takes a while to subside. If it hits a pressure-gradient mic (cardioid or hypercardioid, for example) in which the diaphragm is inherently quite floppy, the diaphragm can 'bottom out' and hit the backplate insulator. This is mechanical clipping, and not only does the wanted waveform become distorted, it can also take a surprisingly long time for the diaphragm to recover properly. Also, some amplitude modulation occurs where the wanted higher frequencies are modulated by the very low-frequency diaphragm-waggling, and that process can quite easily last for half a second or so. Quite a lot of the following word can be affected, and that's what makes it so difficult to process plosive blasts effectively. As always, prevention is infinitely better than cure, and stopping plosives from reaching the mic is really all about positioning. 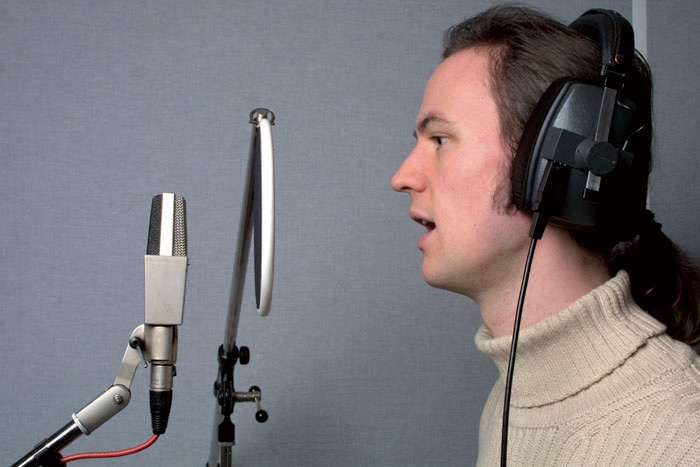 Ideally, the mic should be positioned well above and/or slightly to one side of the mouth. I find that raising the mic to around forehead height works well, as this keeps it away from the track of direct plosive blasts from the mouth, and also encourages the vocalist to stand up straight, which aids their breathing. If the recording environment is adequate, using an omnidirectional mic helps, because it is less sensitive to the pressure changes caused by plosives. If you really want the extremely intimate sound that comes when the vocalist is trying to eat the mic, you must use a decent pop shield and — this is the important bit — make sure there is at least one inch of space between the mic's diaphragm and the pop shield (and ideally two inches or more). Again, using an omnidirectional mic reduces the susceptibility to plosive blasts, as well as negating proximity-effect variations as the singer moves back and forth. Perforated metal screens seem to be better than single or dual-layer fabric pop shields, and purpose-designed, open-cell foam pop shields are better still. I particularly like the universal Håkan P110 (available from Sound-Link Pro-Audio), but the Rycote pop shield that forms part of the Studio inVision kit is also superb and very easy to use. Another way to prevent plosive blasts is for the vocalist to learn decent mic technique, turning away or side-stepping slightly so that plosive blasts aren't directed straight at the microphone. If you have to salvage a recording that suffers from plosive blasts, the first option, if possible, is to replace the offending syllable with another 'pop-less' one from elsewhere in the track. Failing that, the best plosive-processing tool I know of is a software plug-in from CEDAR called DeThump (available for SADiE, Pyramix, ProTools and CEDAR's own Cambridge system). It's not cheap, but it's the only thing I know of that can remove plosive thumps cleanly and without artifacts or compromised sound quality. If you can't afford the plug-in (CEDAR do tend to be beyond the budget of a bedroom studio), CEDAR offers a bureau service where you can send them the defective track and they'll clean it up for a modest fee. If that's not a viable option, try a combination of fader automation and an automated high-pass filter to control the LF thump (although this rarely works without some audible compromise). Another option — which I generally prefer — is to use a spectral editor (like Adobe Audition or Izotope RX2) to reduce or remove the LF content during the plosive. The bottom line, though, is that using and optimising any of these kinds of processing tools and techniques takes considerable time and skill. Life is so much easier if you pay attention during the recording and deal with plosive problems there and then; move the mic, fit a pop shield, or record a better take. If you ignore such flaws in the hope that you can fix them later, you'll spend far more time processing, get much more frustrated, and end up with inferior results anyway!